I’m trying something new here today. 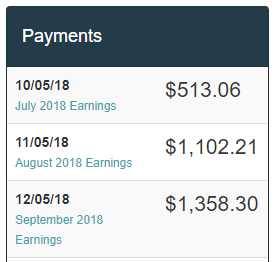 I have my first ever income report to share with all of you. This income report will cover my earnings through display advertising only (the ads you see in the content and sidebar of my site). I do not include any income earned through any other sources, like affiliate marketing. Affiliate marketing makes up the bulk of my income! This income report is just what I’ve been able to add on top of what I’ve already been making! All of this money is extra bonus money. Our summer was rather quiet. 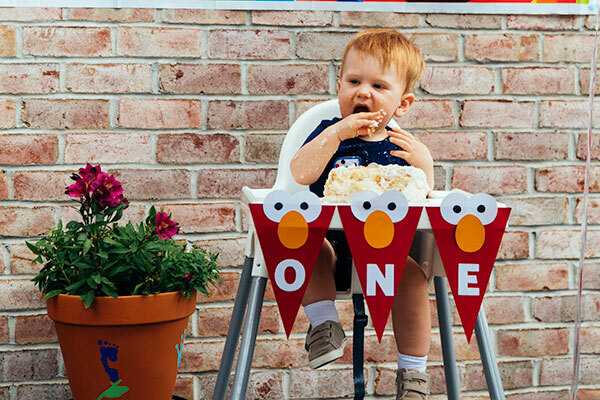 Vincent turned one back in June. 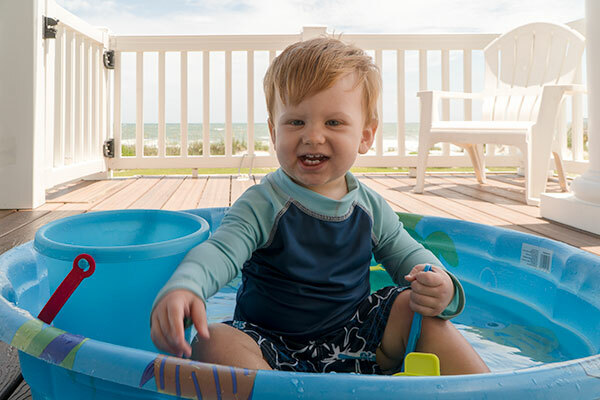 We did take a trip down to Top Sail, NC. Amanda was diagnosed with Stage 1 melanoma earlier this year. Luckily, we caught it early enough that it hadn’t spread beyond the surface of her skin. She had to undergo surgery and had complications arise that slowed the healing process. Today, she is fully healed and back to her old self again. 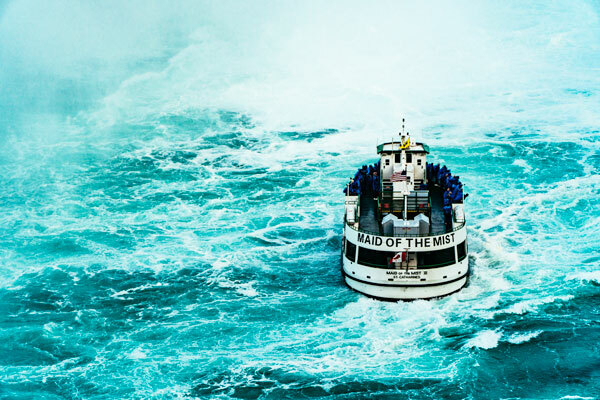 To celebrate the healing, we did a spontaneous overnight trip to Niagara Falls and Niagara on the Lake. Travelling with a baby definitely has its challenges, but it’s nothing we haven’t been able to overcome. Other than that, I’ve mostly spent my summer working on the site, improving functionality, and trying to increase earnings. 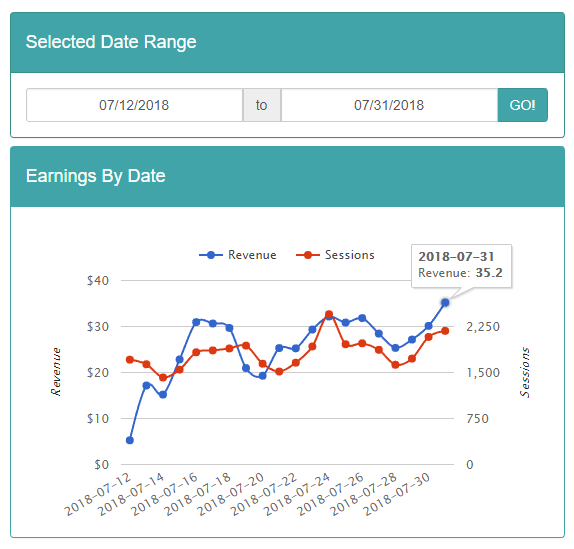 After 11 years of running I’ve Tried That, this will be my first ever income report here. I recently started getting into display advertising. 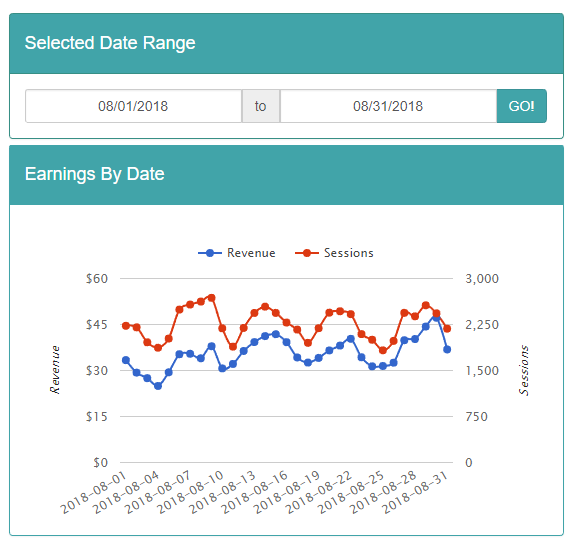 After being nudged along by Dom at HumanProofDesigns, Nate at OneMoreCupofCoffee, and Eddy at WorkatHomeNoScams, I took the plunge in July and added ads to the site. I was hesitant as ads can be intrusive and ruin the user experience just for the sake of getting a little extra revenue each month. I decided I wanted to test it out over a 3 month time span and see what kind of money I’d make and if it would have any effect on how people use my site. I applied at Mediavine, was promptly accepted, and started running ads all within a few days. This is the biggest area of concern for me. I wanted to use ads, but not in a way that impacted how people browsed my site. In the end, I found that display ads had little to no effect on my sites metrics. For comparison, here are some metrics from the first 5 months of this year compared to the entirety of last month. On the left, before ads. On the right, after ads. As you can see, there was very little change in how people used my site. 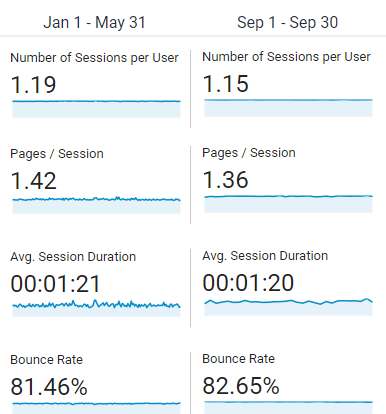 Yes, there was a drop in return visits and multiple pages viewed and an increase in bounce rate, but the difference is so negligible that I do not consider it significant. I also have received zero user complaints since turning ads on. I’m a bit obsessive when it comes to page load times. Page speed has been a part of Google’s algorithm for a while now and I’ve made it a priority to make sure my site loads as fast as possible. Ads have definitely had a negative impact on how quickly my site loads. As you can see, there’s been a drastic decline in page load times. From a personal stand point, I haven’t noticed that much of a slow down. Yes, it takes my site longer to FULLY load, but the initial load is as fast as it’s ever been. The site loads quick and you can begin to browse without issue before everything is fully loaded. One reassuring factor is that Mediavine is obsessed with page speed times as well. Mediavine wants my site to load fast. They share a percentage of my income. The more money I make, the more money they make. Google Search Console only lets me go back 90 days. Ads would have been turned on near the start of this chart. Adding ads to my site has had no impact on my rankings. Since Google limits how far back we can see, I pulled up my charts in SEMrush as well. And the keywords that I am currently ranked for. In fact, traffic has been the highest it’s been in the past year! My efforts to grow the site and a renewed focus on proper keyword research and SEO are the cause of my growth. In conclusion, ads have had no negative impact on my rankings. 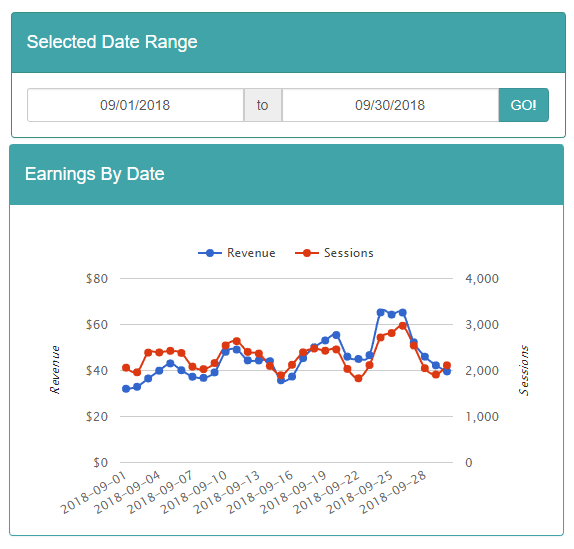 Since this is my first ever income report that shows only income earned from display advertising, I will include the first 3 months of my earnings in this report. I joined Mediavine on July 12th. This explains why my July was entirely unremarkable. By July 31st, I had made $513.06. I also joined during the third quarter of the year, which is when advertisers historically spend the least amount of money. Everything was working against me in July. I had an average $14 RPM (RPM stands for Rate Per Thousand, meaning how much money you make per 1,000 page loads on your site) with a daily high of $16.91. I was initially discouraged, but after speaking with Mediavine (their customer support is FANTASTIC by the way) they assured me it was common to see low numbers in the first 3 months. They will be testing different things to find the optimal ads to pull in the most amount of money. I powered through and then we hit August. I finished August with $1,102.21 and a daily average of $15.71 RPM. I had a daily high of $19.42 RPM. A nice improvement over July, but still a little bit short of where I want to be. My site did see a nice boost in traffic as well. I have recently started to pay more attention to the content I’m publishing and going back and updating & optimizing old articles as well. 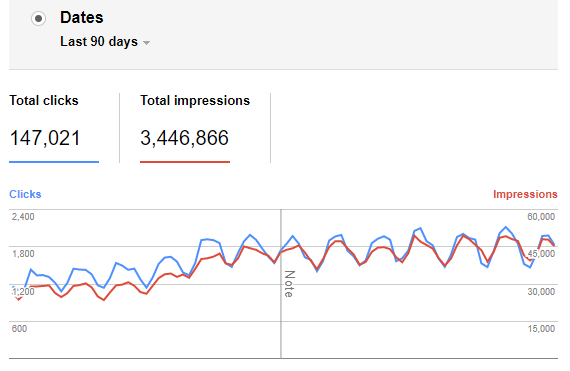 My new strategies, combined with Google’s August update, has boosted both my traffic and earnings. Finally, this brings us to September. September has brought in my best month yet with $1,357.56 in total earnings and a daily average of $19.73 RPM. I also hit a RPM high of $24.60 and a total daily earnings high of $64.24. While this is closer to where I want to be, I’m still a few dollars short of my goals. 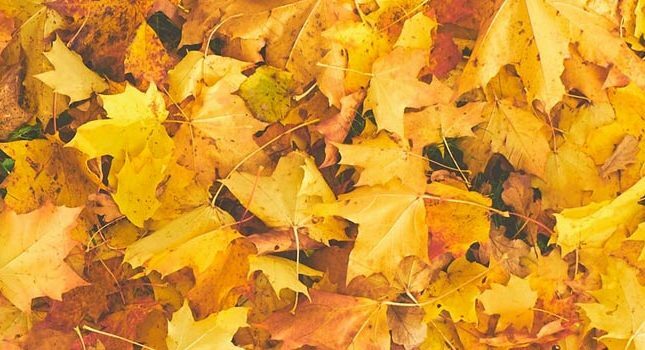 The start of October brings around Q4, the time of year where advertisers vastly increase their budgets. Everyone is gearing up for Black Friday and Christmas and I’ve been told to expect my earnings to absolutely explode over the next few months. We shall see and I’ll be sure to keep you all updated. Single Daily Visitors: 4,000, 5,000, 7,500, & 10,000. Monthly Earnings: $1,500, $2,500, $5,000, & $7,500. I will revisit these goals and milestones with every new income report. First and foremost, I plan to increase visitors to my site by continually adding new content in the form of articles to my site. I am also going back through old articles that have dipped in the rankings to better optimize them and get them higher up. That will work on increasing visitors and earnings, but will have very little effect on RPM. RPM is improved by getting people to stay on my site longer. I have been going through my top ranked posts and writing better headlines, more compelling text in the introduction to capture attention better, and have been lengthening the content. As you may have noticed on this post, my paragraphs are at most 3 lines long. This helps keep people on the site longer. This article is nearly 2,000 words long, but the short sentences makes it easy to read. Longer time spent on site + more ads via longer content = higher RPM. They’re the entire reason I’ve been able to add over $1,000 to my earnings each month. I first started making money online back in 2005 through Google Adsense. Display advertising was the reason why I got into this business. I like that all I have to do is write content and get people to visit my site. I don’t have to sell anything, link to anything, buy anything, convince anyone of anything. I write. People visit. I get paid. If you run a blog and have over 25k visitors per month, you need to sign up for Mediavine ASAP. I credit SEMrush for helping me get my site back on track. My traffic was in a free fall at the beginning of this year. The tools at SEMrush helped me identify and correct a number of glaring issues with my site via the Site Audit tool. They sent their crawlers and found thousands of errors that I had overlooked, including some of the worst possible SEO mistakes you could make. If it wasn’t for their Site Audit, I firmly believe my site would have very few Google rankings today. On top of that, their keyword research tools are incredible. The keywords they’ve been able to find, combined with my own personal SEO strategies, have helped propel my site back up the rankings. Traffic continues to grow and that’s all thanks to SEMrush. Wealthy Affiliate is where I really got my start online. Their completely free membership can’t be beat. If you have an interest in making money running a website, they’ll provide you with all the tools and training you could possibly need. You can have your own website up and running at the click of a button in 30 seconds or less. Best of all, you can become a member there at absolutely no cost to you. Can I help you out? I’ve been tossing around the idea of teaching the strategies that I have personally developed to launch and grow a successful website. It doesn’t take much to make an income online these days. It really comes down to identifying what people are searching for online and writing content to match their expectations. With tools like SEMrush and Wealthy Affiliate, the only thing you really need to do is know how to write compelling content. That’s what I do best and want to be able to teach others. Would you have any interest in learning from me? Sound off in the comment below. Great article! Just found your site, love it and already have send a few links to family/friends. Would love your advice/guidance/mentorship so, yes, I’m interested, too! Sounds great. I am interested. This is a really incredible post! We love hearing success stories from our publishers, and we are so honored to be a part of yours. As publishers ourselves, we totally agree that ads aren’t our favorite. That’s why we do everything in our power to make them hurt less. With ads, it’s definitely all about finding that balance between user experience and income. Regarding site speed, that’s something that’s so dear to our hearts, especially because of speed’s role in SEO. What’s important to keep in mind is that some of the tools you mentioned give a speed score of an entire page, from top to bottom. A reader will take in your site a little bit at a time, so those scores don’t accurately represent how users are reading your content. At Mediavine, we only load two ads on page load, and lazy load the rest, so they don’t exist until a reader reaches them. We recommend Google Page Speed Insights for testing speed because it focuses on the first screenview, and then ads would load as a reader gets closer to them. 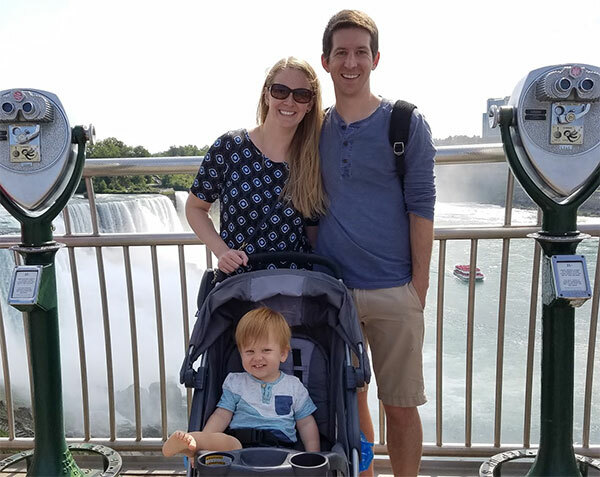 Thank you so much, Steve, for sharing your Mediavine earnings in your first income report and congratulations on your amazing growth! We are really excited for a great Q4, and are so glad you are here with us! Thanks for the clarification Susannah! I just now ran the site through Page Speed Insights and saw no change in score with ads on vs ads off. In Google’s eyes, ads have zero impact on my site at all. Great news! I will make a few adjustments to my post and update it accordingly.